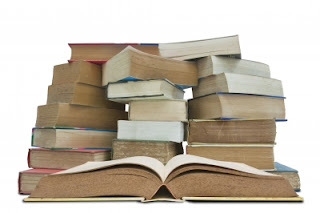 The Book Garden: The Curious Reader - Is there such a thing as too many books? The Curious Reader - Is there such a thing as too many books? Now before you shake your head in disbelief at such a silly question, please hear me out. Obviously there is no such thing as too many books, because how could there ever be too much of a good thing? So let me rephrase the question - is there such a thing as owning too many books? All right, you might still question my sanity, but let me explain myself. Once the ceiling starts sagging, you know you should have stuck with the paperback edition. Books are heavy, some more so than others. Come to think of it, just because you resort to buying paperback editions only probably won't keep the ceiling from sagging if you keep on piling them up by the dozen. Bottom line would be you buy two paperbacks instead of one hardback and no matter how you look at the it they will need the same amount of shelf space and the weight will be the same too. The only difference being that the actual amount of books would be higher if you stuck to paperbacks only. The ceiling would still be considered a safety hazard for those living downstairs. Have I lost you yet? Yes? Never mind. No? Don't worry, we're getting there soon enough. You see, the average person doesn't have the luxury of owning a library the size of an Olympic-sized pool, which causes a problem all fellow book hoarders are painfully aware of - the question of storage. Don't blame it on too many books. Blame it on too little space. Ultimately I'd prefer to keep them all, but when all the shelves are packed, trunks are filled, and boxes stacked, then there is no way around admitting that you've got a tiny little problem. Until I find out how to get a suspended ceiling in place to put all those books there which I am bumping into while navigating my apartment, the only solution is out with the old. Let's face it, otherwise there'd be no place for the new. Personally I have reached the limit of available shelf space at least a dozen times already. Every time this tragic event takes place I set out to do a little book purge and get rid of those volumes I don't see myself reading again. And even though I know I will never read these books again I never make it through this process without the obligatory sad face and weary sighs. Since I started buying more and more used books this isn't as hard as it used to be compared to when I picked out books I bought new and which cost way more money. Apparently it's easier to throw out stuff that costs less. The only upside I can see is that I can share the bookish love with fellow readers, sometimes make a buck or two reselling, and most importantly have enough space again to bring in some new books. When all else fails there's always the Kindle! What are your thoughts on this? Do you admit to owning too many books? Are you even a compulsive book hoarder? Have you ever run into problems with declining shelf space? Be honest, how many books do you own? And how many more do you think you'd be able to squeeze in? Yes, I have too many! I have 387 unread books. I put myself on a book buying ban. Recently, I slipped and bought three. So now I am on the ban again. There is plenty to read but new books are always calling to me. I used to have 420 so I am improving. But need to reduce, reduce, reduce! Now that's quite an impressive number! If it's any consolation I had about as many books too one time and I did several book purges along the way to reduce the number (and get rid of books I no longer saw myself reading anyway). Right now I have about 140 unread books, give or take one or two, so that is quite an improvement, plus I now think twice before buying a new one! I passed the manageable stage two years ago and weren't it for some serious book purging I wouldn't have been able to get back to a more decent number of unread books (about 140 as of now). I vowed to keep the number of unread books down, but first I need to reach my goal of shrinking those stacks to 100. Wish me luck and enough time to read! There is definitely such a thing as too many books. I'm such a book hoarder and.. yes.. there is navigating to be done in the bedroom. /sigh. It's frightening! I need to go on a purge but that might have to wait until after Bout of Books so that I can really spend a good amount of time making sure I get rid of things I don't need. Perhaps I should use my Kindle more but I find myself getting bored of the Kindle when there are nice smelly books with attractive covers to be read. So I think my resolution will be to use the library more. If I don't necessarily need to add a book to my collection, the library is there. Besides, saves money on those books that end up being a royal disappointment. I almost bought Peter V. Brett's book, positive I'd love them, but ended up unable to afford them and hey the library had them so I borrowed. Book 1 was good but book 2 I couldn't finish. Money saved! Book purges have helped me a lot, trust me! At first it was painful to part with so many books, but if you don't really think you ever read certain tomes, why keep them? Using the Kindle is a great way to avoid bumping into book stacks that's for sure, still I do behave with eBook purchases. They might not need any physical space, but I need time to read, right? A library would be the next best thing, but sadly we don't have a decent one where I live *sigh*. I don't think I own too many books, but there might be such a thing as owning too many. I only have about 150 at the moment, about a quarter unread, and I don't think that's quite enough. One day I want a room or a wall just full of books from floor to ceiling. If I don't happen to have a spare wall available for books then I still want to own many books but instead of shelving them I'll use them as furniture and to decorate. Only if you literally have no space at all should you consider donating some of your books. But only the ones you'll never read again and can't pass on to children. Now a wall with floor to ceiling shelves would be neat. That way there was no need to go on a book buying ban or to discuss reducing the number of unread books, yay! There is never too many books. I suppose people would say my husband and I own too many books --in our 810 sq ft apartment there are four 8 ft tall bookcases in the living room area, two 8 ft tall bookcases in the kitchen, hallway there are six 6 ft bookcases...There is always room to put another bookcase as a life without books surrounding you is a life that isn't a life at all. I've learned that no matter how little space is left, you always find a way to squeeze in one more book. Of course if you live in a shoe box like myself then you reach the moment of "too many books" rather sooner than later. And right now I am envious about all your bookcases! Did my sharing of books rub off on you? But seriously, this is what I do these days too. I just can't keep them all and giving them away is a great alternative to becoming a book hoarder with no room left to breath, plus if you get rid of a book you may buy a new one, right? I'm not a hoarder, but I have way more books in my little apartment than should actually fit in there. We do cull from time to time, and trade stuff in at the used bookstore (and I just discovered Paperback Swap!). . . but then I just use my credits to get more books. we just need a bigger place! Yep, that's what I often think myself! A bigger place would really do the trick! Of course you still need the time to read them all, but at least storage would be taken care of.